- Delivery: The DynaLock 2511TJ Single Electromagnetic MiniMag Lock is factory-ordered, please allow 3-4 working days' lead time. Single coil. Mounts to the face of the frame header. 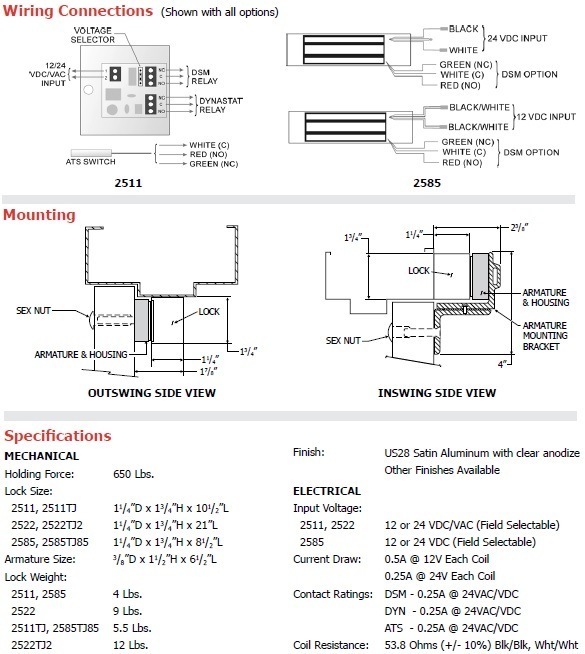 12 or 24 VDC/VAC field selectable. Each 2500 Series Electromagnetic Lock is comprised of 3 basic components: a lock housing, an electromagnetic coil, and an armature. The coil and housing assembly mounts rigidly to the door frame while the armature mounts to the door in a manner that allows it to pivot slightly to compensate for door irregularities. When the door is closed and the lock is energized the armature is magnetically bonded to the lock face, thus securing the door without utilizing any moving parts. Single and double door models are available as well as the 2585 Series, which has a shorter housing. At only 8-1/2" long, the 2585 "Bantam" lock is perfect for installations where space is limited. All locks are designed for eas of use, and built in the USA to last a lifetime. - Holding Force - 650 lbs. holding force provides for effective traffic control. Examples include interior office doors, clean room interlocks, tool cribs, and x-ray areas. - 4 Operating Voltages - All models (except the 2585) offer 12 or 24 VDC or VAC for installation flexibility to reduce stock. - Low Power Consumption conserves energy, reduces operating cost, and extends battery backup time. - No Residual Magnetism - The lock releases without delay when de-energized. - Narrow Backset - A thin lock section (1-1/4" ) may mean the elimination of additonal mounting brackets.